First, a little bit about the history of Knightmare. If you have no intrest in this, skip down to recruitment info. 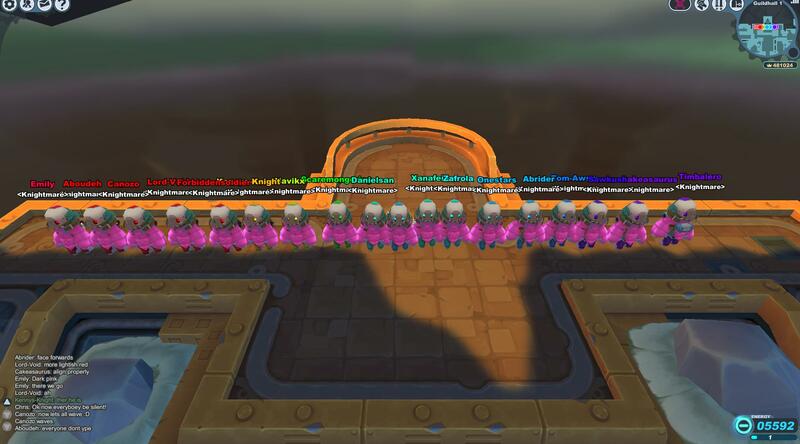 Knightmare was started during the spiral knights preview/beta and quickly became one of the largest and most successful guilds in the game. We were able to kill Vanaduke (pre-nerf) with all 2star gear, and had could run through tier 3 in our sleep. 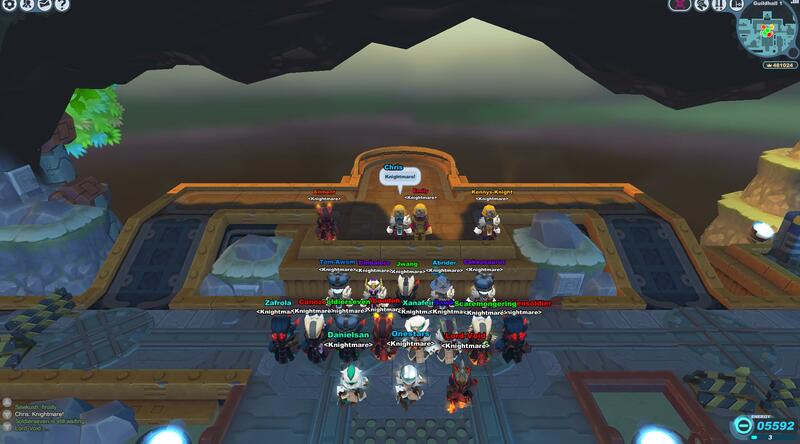 During the early release, Knightmare reformed and started recruiting old and new members, and was free to join for anybody who had played during the beta and was mature and active. Knightmare remained as a top guild throughout the public release until myself and many of Knightmare's officers decided to boycott the game because of the auction house update which brought bind-on-craft and ridiculous crafting costs. Knightmare returned from the boycott months later because of the return of pvp. We have some of the game's most skilled, wealthy and knowledgeable players. Now, Knightmare members spend most of their time talking on vent about gear theories and money making methods or clearing end-game content such as the Shadow Lairs. We are only looking to recruit mature and active players who want to do boss runs, PvP, recipe grinding, trading, and chatting. Knightmare prides itself in being one of the most mature guilds in all of Spiral Knights with most members over 18 years old and many members over 25 years old. We more than welcome new players and players who aren't geared or experienced as long as you are mature, active, and willing to improve. Also, to any younger applicants, we have had great success in the past with mature players under age 18, age is only a number. Currently Knightmare gets 5+ applications per day and only removes 2-5 people per week for inactivity. We recommend you apply only if you are in full 5* gear and ready to have your Firestorm or Lockdown tryouts. Please send them MAIL with some note like "Applied to Knightmare and need to be tested out"
If you feel that you are much stronger in lockdown than in fsc you may have your tryout in lockdown. Please add the lockdown council with a note saying "Knightmare lockdown tryout"
Glad to be back in my original guild. Since it went inactive from the boycott I joined Echo of Silence! Wonderful guild! Hats off to Njthug and Dogrock for keeping a great strong guild. Now Knightmare is back in business and ready for PvP! Apply at the website above (knightmare.guildportal.com) and hope to delve with you through the Clockworks! Thank you very much for the invite but I have had a great time at EoS and it will be unfair to suddenly leave all behind after all this time. I hope won't be hard feelings and we will see you in the clockworks soon. Date you started playing Spiral Knights: The day after the end-of-the-world Crafting update... so May 18th? Sometime around then. Time played on average per day: About 2-3h I guess, but I've been playing solo for the past while with no real reason to stay online once I've done a run or two. I'd be more active if I had a reason to stick around, which is why I'd love to join a decent guild. Time played on average per week: Let's say 4 days/week? I'll mostly squeeze in SK time when I don't have plans at night or during afternoons where I don't work. Killed Wolf boss? : Lawl Snarb. Killed Jelly King? : I've gotten two Antiguas, so yeah, I've killed this enough times ^^. I've yet to do a serious solo attempt, though. Killed Vanaduke? : Yep! Can't do it solo for the time being, though. Also it's damn hard to find a party that isn't terribad. Been to the core? : Self-explanitory. ...I'm a pure Gunner. Could you tell? Previous guilds? : None that are noteworthy. ^ahhhh feed its been so long since ive gone into the clockewerks with you!! hahah we gotta do it again some time. CO! WHERE THE HELL HAVE YOU BEEN?! You brought my attention to this guild in my thread and I like it. I am no longer using my main, and made a new char today and I already have close to the same gear. I'm not making as many mistakes as I did. The char is going to be a bomber. Date you started playing Spiral Knights: June 15th? 16th? around there. Time played on average per day: 5-6 hours, I don't have access to a computer on the weekend. Killed Wolf boss? : Snarby's easy. Killed Jelly King? : A few times. Soloed your way to the core? : Aha, ahahaha I am waaay to bad to be able to do that yet. Been to the core? : Nope. How you acquire energy: grinding Arenas, recipe runs. Current set of gear: Since I started this char today, Spiral Demo Suit and Helm, and the starting weapons. What makes YOU the person we should accept into our guild over the 100s of other applicants? : Not really anything. I'm not really special, i'm not super skilled but I can offer tips and I'm getting better. It's totally up to you to invite me or not, like it was before you knew anything about me. We have accepted a group of applications, as well as wait-listed most of the rest. Added a new wave of recruits, tons of great additions to the guild. About 5-10 people online at all times doing runs/pvp! We have a great PvP team and we would like to recruit people who like to do PvP, as well as go down into the Clockworks! Uploaded a bunch more videos to our youtube channel! I been looking for a mature guild without all the drama that games bring along. So this pretty much appealed to me. Date you started playing Spiral Knights: About 2 weeks ago. Time played on average per day: 2 hours after mid-night EST And maybe 4+ Hours on my days off. Need that money. Soloed your way to the core? : Nope. How do you acquire energy: Buying Selling What not. Current set of gear: At the moment... Ash Tail set level 5 Barbarous Thorn Shield Avenger and Sixsilver planning to upgrade everything once it hits level 10. Don't have much experience with this game but alot of experience in other games that can relate to this one, examples being ragnarok wow and ff11 and lol all based off of team work and common sense. So yeah... and plus i just want a guild that also talks and knows how to joke around having a fun time while at the same time will do missions together and what not. plus i love the fact of pvp since pvp is one of the only things that makes a game great. We will try inviting Djturtle, but as you have not included your IGN and often times your account name is not your ign, you may need to post that here. Normal play hours(GMT): This is very random, I'm up at odd times. Current set of gear: Vog Cap low stun, Vog Coat low ele, Volcanic Plate Shield low normal, DA Med CTR, Ascended Calibur High beast, Gigawatt Pulsar, 4th weapon differs, Low ASI trinket, Low CTR trinket. I dunno. I guess I'm just awesome? Why wouldn't you want to accept me? I'm almost perfectly set up for FSC, though I've never been able to do it and want to get my crest already. D: I'd love some people to talk to while I'm beasting on things ingame or to farm FSC with me. How you acquire energy: Buy with crowns by going on JK stages. What makes YOU the person we should accept into our guild over our other applicants? : Nothing much really but I am kind to people on Spiral Knights and give lots of free things to newbies like free materials and some armour. I also give my friend things they need for things they are trying to make or get. ( That includes crowns, CE and materials) I try my hardest to be kind to other people. I really want to join this guild. I hope I'm good enough to get in this guild! This guild looks really cool! Date you started playing Spiral Knights: Somewhere in Juli don't know what day. Time played on average per day: 2-3 hours more if i have some money to spend on ce. How you acquire energy: Tier grinding, Material grinding, Depth gear grinding. Active in solo PvP? : Sometimes to busy grinding for better gear. Active in team PvP? : Sometimes to busy grinding for better gear. Well actually I did a double post so I changed it. The other post was just telling things. LOLZ. How come I'm not in the guild anymore? Who did I annoy and how?